Freedom and stimulation help creativity blossom. Climb out of the box! 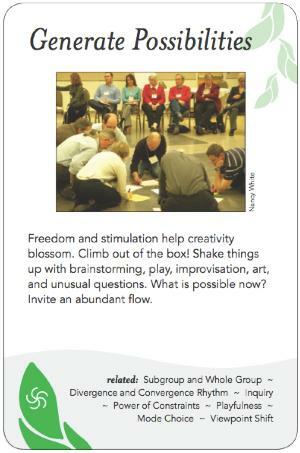 Shake things up with brainstorming, play, improvisation, art, and unusual questions. What is possible now? Invite an abundant flow. Applicability: When do we need to use imagination and creativity? When a group is stuck at an impasse, or stuck in old habits of mind/patterns of acting. When the current and known alternative approaches are no longer viable. When it's necessary to challenge the status quo, in the face of complexity and hyper-turbulence. Humans are incredibly adaptive, so huge constraints can push us into a new level of creativity. If we limit ourselves to only evaluative and deductive approaches we can't generate something new. The work of the imagination is spiritual work. "Imagination is evidence of the divine." Brainstorming is the free generation of ideas while suspending judgement/evaluation--with the purpose of significantly broadening the range of ideas/possibilities to explore/consider. Getting the maximum number of uninhibited/unfiltered ideas from the maximum number of participants. A facilitator prompts brainstorming by posing a provocative question that everybody can understand. Say whatever comes to mind without self-editing; no idea is too crazy; no judgement or critique of others' ideas; everyone is encouraged to participate; build on others' previously stated ideas if you can, etc. Best used when there can be a wide open range of possibilities to explore, and when it is way to early in a project for the conversation to make final assessments. It's a good way to involve group members actively who may otherwise be shy or reticent to participate, because the structure provides a clear way to make contributions with minimal risk since there will be no critique of ideas offered. Helps if facilitator is extra appreciative of the most far out ideas, to affirm the value of true creativity and the ground rule that anything goes. Brainstorming originated with Alex Osborn, a 1950's advertising executive. Facilitators may have to prepare/prime participants to engage in imaginative/creative thinking; for example, providing context/a rational explanation for why this is valuable/meaningful, or reassurances that all can do this, to reduce performance anxiety, etc. Most adults have had their creativity squelched, so participants may need to relearn/have help accessing their creative instincts. Imagination and creativity may take time (or more open-ended time). Creativity is not a linear process that can be rushed or produced on demand. It is risky, so people may be hesitant. If shot down or punished they will be less likely to take risks again. The facilitator's job is to make the space safe for risk taking. The group must be aware of what the limits of its authority are, if any. There is no point in encouraging creative solutions if those responsible for implementing them are not open to significant change. Imagination and creativity are often best achieved through solitary effort and reflection. Be sure to give participants time to think and work alone, as well as in a group, to achieve the best imaginative and creative outcomes. The facilitator/scribe should capture contributions exactly as offered; no editing/summarizing. It may be necessary to draw people out; for example, facilitator could invite participants to go around the circle so everyone contributes in turn. Don't expect/assume that brainstorming will immediately lead to an obvious best solution that everyone will agree to. It may only be the first of many steps/stages toward finding a solution/an agreed upon action path. The list of possible patterns for this project! Carol led a group of consultants in a brainstorming, using an approach that involved serendipity -- the drawing of a card -- to provoke a creative shift in the group's thinking. Dave worked as an innovation consultant helping companies imagine radical solutions to critical business problems; the innovation process his clients used entailed a mix of (right brain) imagination and creativity and (left brain) research, analysis and critical thinking. 9. give yourself time and space.